How far does the WAPJ signal go? 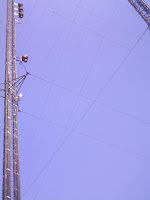 Having our 89.9 MHz antenna at about 1300 feet above sea level on Highland Avenue helps a great deal but the hilly terrain, especially to the west and north of Torrington, can cause reception problems. This link will give you an idea of our coverage area is in theory. The inner circle is our "primary" coverage and everyone should be able to get the station no matter what kind of radio they are using. The area between the inner circle and the middle circle is our secondary coverage area where reception is possible but may require a better radio or perhaps an antenna. The area between the outer circle and the middle circle is our fringe coverage area, some people, especially those with very sensitive radios or those folks who live on high ground can hear the station while others may not be able to. Note that this map is based on computer modeling, in real life radio signal can and do go much farther than predicted. The station has been heard as far away as West Hartford, Canaan, Granby and Waterbury. “Footlights and Spotlights” is a show about community theater news in and around the Torrington area and Connecticut; as well as Broadway and Hollywood news and music. Audition and performance information are provided; along with listings of other fun events.. The show also spotlights musicians, composers, artists, businesses, non-profits and events of interest in and around the Torrington area. The occasional guest or guest co-host livens up the show. Listen on Saturday’s from 4pm to 6pm. If you missed the Classic Rock Mini Concert for Friday, August 22, you missed 36 minutes of Squeeze, who will be in Torrington for a concert on Monday, August 25. Since I don't always know who I am going to play until I get there, you will just have to tune in Fridays from 8 - 11 to listen to the Classic Rock Show with Tony Henry. So, WAPJ is that station in Litchfield...right? 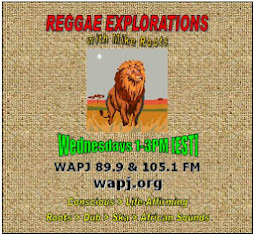 For any number of reasons you may be unfamiliar with WAPJ 89.9 & 105.1 FM. Perhaps you're new to the area or just simply never tuned in or weren't even aware of the station's existence- until recently. 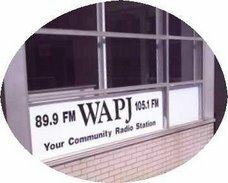 After being with the station since it's inception, I am surprised some 11 years later how many people in the Torrington area still aren't aware of WAPJ or never listen. (And there are some who confuse us with a certain station located in Litchfield...sigh.) There a number of reasons for not listening. Many find our eclectic programming is simply not their cup of tea and would rather listen to a station which plays a particular format. In fact, most of our listeners only tune in to hear a certain program or programs during the week. And that's fine. We'll never compete with the A/C format stations or the ones which focus on Top 40, pop, alternative rock, classic rock, etc. That's just not who we are though we do include these and numerous other musical styles in our programming. What we do have is a group of dedicated staff who know their stuff, such as Brian Lillie with "Pickin' and Fiddlin'" (bluegrass) heard on Wednesdays from 7:00-9:00PM or "Celtic World" with Pamela and Tony Henry which can be heard on Thursdays from 8:00-9:00PM and Fridays from 10:00-11:00AM (rebroadcast). And there are many, many other shows to choose from with more being added. We also provide play-by-play of Torrington High School boys basketball (courtesy of Luke Hutchinson and TJ Burlee) as well as comprehensive coverage of local elections. So go ahead and take a look at our schedule. There's a link to it right on this page. You're bound to find at least one show you'll like. Let us know what you think by sending us an e-mail to wapjtoday@gmail.com or wapjfm@sbcglobal.net.